If you are a regular reader, you know that my Main Man has been out of town since Tuesday and I have been using my solitude to clean and reorganize my sewing "studio" -- actually my "half" of the basement; his real architect's studio is in the other half. I relocated my tall bookcase to the garage entry hall -- which required emptying that corner first. Those boxes of books went into my car to be put in our storage unit tomorrow. I now have over 250 books cataloged and arranged alphabetically on the shelves. Note that the bookcase is taller than the door on the left that I had to bring it through and there is a substantial light fixture that I had to negotiate, as well, all by myself! Needless to say, I am doing a HAPPY DANCE today. With my Main Man out of town for the remainder of the week, I decided it would be a good time to reorganize the sewing room (which faces his office space on the other side of the basement). See that tall wooden thing on the right? I moved that bookcase by myself into the garage entry hall today. I will be cataloging all my books tomorrow before I replace them on the shelves. I also moved my sewing table closer to the windows. All of these Itso cubes with their storage boxes have been moved to the fireplace hearth (it's never been used and probably won't be as long as we're here). I'm contemplating what will go on that wall in their place. Originally I had planned to install a large semi-permanent design wall, but the cable TV connection is on that wall, as well as an electrical outlet and the central vac connection we never use. I'm thinking a desk where I can work on EQ and write patterns might be more beneficial. I'll wait for MM to return home before I start moving more furniture. I'm whipped!! Wow! Where did last week go? Last Monday I talked to a local guild about fabric selection for stacked repeat designs -- specifically 4-Patch Posey. It went well, was well received. But, gosh, does it take a lot out of me to get up in front of a group, deliver a message, and appear peppy and composed at the same time! Tuesday morning I had breakfast with Sarah from Confession of a Fabric Addict to deliver over 50 yards of stash fabric for her quilt ministry. What a delightful person! She definitely "walks the talk", if you know what I mean. She's the second local blogger I've spent a little time with and it really makes a difference to have a face to put to the page. Thursday evening I met up with some of my "inner circle" for dinner. There's been a lot going on in their lives and we just needed a group hug. One of us took the opportunity to honor her secret sister with a belated Spring/early Memorial Day remembrance that included light-up glasses. I won't say who was doing the honorin' or who the honoree is ..... but a good time was had by all. We've got husbands undergoing open heart surgery and others with knee (or is it hip?) surgery and another moving house .... As Robin Roberts' mother said, "Everybody's got somethin'. Friday I spent the day getting ready to do a test run on a new pattern at our guild. And Saturday was the test run. Got lots of good feedback on the pattern. Now if I can just figure out how to get EQ drawings into the pattern, "exploded" and with notations.... At least I have until October to finish it! Sunday the handbells played at church. Rehearsals went extremely well. But during the performance of the prelude my mind just went to another place. There's no other explanation. I was so moritified at screwing up that I left before the service began. Maybe it's time to give up the bells -- though I think it's one of the things that continues to exercise my mind (and body, for that matter). Monday rolled around again and it was my turn to host our monthly "Slow/No Sew" gathering. While we normally gather on a Wednesday, we chose the holiday so that our one working member could attend. Unfortunately most everyone had other plans; attendance was small, but what we lacked in quantity we made up for in quality. That pretty much brings us up-to-date. In the fauna department, I'm looking out at rhoddy remnants. They always make me think of giant spiders. There is a lot of new foliage coming on in place of the blooms. The Mahonia are loaded with berries. The deer don't seem to like them as much as day lily buds -- go figure! A couple of months ago I asked if anyone knew what this is. No response. This is what it looks like now. Stems are about 12" tall. I still don't know what it is. Lenton Roses and Soloman's Seal are through blooming. We'll enjoy the foliage the rest of the summer. Soon to show color: clematis, astilbe, and coral bells. Life is good on The Hill!! Prepping for a lecture later today .... Topic is "Fabric Selection for 4-Patch Posey," a class I will be teaching at that guild in August. Four-patch posey is one of several design techniques that rely on stacked repeats of fabric to achieve the desired effect. Others are Stack-n-Whack, trademarked by Bethany Reynolds, One Block Wonder, introduced by Maxine Rosenthal, Serendipity, coined by Sara Nephew, and Kaleidoscope, frequently seen in Paula Nadelstern's quilts. The secret to success in any of these is fabric selection. Unfortunately, it's hard to know if you've picked the right one until the fabric has been cut. Mirrors help ... sometimes. Posey is one of the simplest, requiring only four repeats of fabric cut into squares but, to me, choosing the right fabric is harder, though I am at a loss for words to explain why. It just seems to me that triangles and diamonds for hexagons or 8-point stars yield more dynamic results. Nevertheless, Posey is an easy way to learn how to layer the repeats to get nearly identical units for your blocks. And the "posies" can be used anywhere a square is used -- for example, the center of a star, or in "4-Patch Strippy" (shown above), free download pattern by Kaye England. So even if the posies aren't spectacular, all is not wasted. I have had best results -- having made 4 and given away 3 -- with floral motifs, lots of variation in motifs and colors, curving lines, and a modest amount of air space between motifs. Bethany suggests using the "palm" check -- no motif should be larger than your palm. To illustrate my points I worked with some fabrics I had on hand ($1 and $2 sale table at Hobby Lobby so I didn't mind if it didn't work). Here is a tightly packed floral with little color or motif variation. Also, the repeat is very short -- the chunks I cut are actually two repeats. The posies look a lot like the original fabric. This would be a better choice, though not perfect. At least there's more variety and airiness in the posies, but the tulips and larger leaves don't meet the "palm" test. Just for fun I tried a very graphic modern print. Not nearly as successful as I had anticipated. But put in the right setting, say Ohio Stars with red or black points, it might work. This "perfect" fabric, IMHO, is all I have left of a 4-Patch Strippy quilt that went to Colorado fire victims a couple of years ago. Even though the motifs are large, there is a lot happening within them. It was hard to give this one away. Linking up with Judy L for Design Wall Monday. Big improvements in the stash department this week!! At guild on Monday I took advantage of the large tables to lay out and measure three projects I had worked on at retreat so that I could cut borders and sashings. "Playing with Colors" is now a flimsy, ready for quilting -- my only finish for the week. 2.75 yards out! In spite of my best intentions, I did not get the borders on True Blue. BUT my time was not wasted. In searching for examples to illustrate a lecture I'll be giving tomorrow night, I came across a group of color-coordinated practice blocks. I shipped them off to Sarah at Confessions of a Fabric Addict who assures me that Rita, her "orphan block queen" will work her magic and create something lovely for their quilt ministry. 1.75 yards out! I didn't stop there, however. Liberated by the feeling of giving up a dozen-plus blocks, I started looking around for other things I knew I would never use or that I had so much of I could share. Soon panels and novelty prints and fat quarters and yardage suitable for backs began piling up. I will be delivering the pile to Sarah on Tuesday. 53.5 yards out !!!!! I have now officially recovered from my spending spree in Paducah. AND I have space on the top shelf for wide backs. AND I have a clean cutting table. When I got home from retreat last week I discovered the perfect border in my stash for the baby blocks quilt -- Crayons! Here it is, flimsy finished and packed away with its back, ready for quilting. It's small enough, I will probably quilt this one myself. Pattern is "Playing with Blocks" by Marci Baker. And I had a near-finish. Again, the stash yielded the perfect sashing fabric for Elegant Garden. I was able to get the inside finished. It's now put aside until I can lay it out to square up and measure for the three borders. 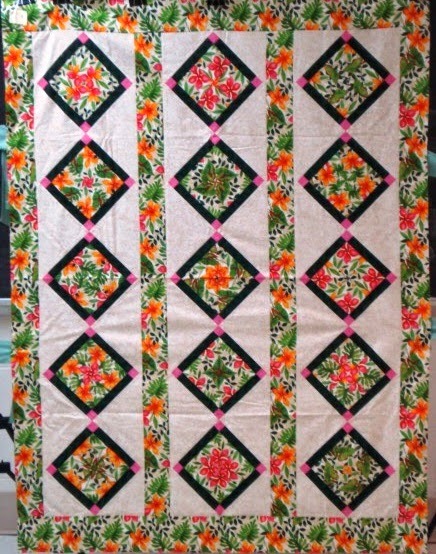 Even though it's mostly floral fabric, my husband really likes this quilt -- maybe it's the black background on the florals. And, surprisingly, he likes the yellow-orange cornerstones. I was perusing my books one day, looking for patterns that would use some fabrics I'd had for a while. I need to figure out which book this came from to give proper credit. Today I'll be putting the final border on True Blue. And mailing some orphan blocks to Sarah at Confessions of a Fabric Addict. Linking up with Sarah's "Whoop Whoop Friday." When I was preparing for my Saturday lecture (which was OK, but not my best) I came across a dozen or more of these orphan blocks. I think I'll send them to Sarah at Confessions of a Fabric Addict for her quilt ministry. There are a couple of ladies in her group, Sarah included, who work wonders with odds and ends. I was disappointed that I was lacking the "perfect" border fabric and not able to complete True Blue and Playing with Blocks last week at the retreat. Stash to the rescue! I'm heading out to guild this morning where I'll use the church tables to measure and cut the borders. Donna and I are also going to try our hands minds at another diagonal pieced border. Tune in tomorrow to see how we did. BTW, Donna discovered a website that has a calculator for John Flynn's formula: www.multi-patch.com. All in all this was a productive week, thanks to three days at a guild retreat. Although I had aspirations of accomplishing more, I'm still happy with the outcome. One yard went for bindings on Irish Gran and the Cruise Quilt, two quilts that had already been counted out of my stash. I added the final border and made the back on Bargello with a Twist for another four yards out. And I used two yards for the back on Sand and Surf. I recounted the process of making the diagonal pieced back in Friday's post here. Total used this week: 7 yards. I came close to finishing True Blue, Baby Blocks, and Elegant Garden. Now that I have selected borders and sashing for these, it should be easy to finish them this week. Happy Mother's Day to all Moms in blogland. Diagonal Pieced Back -- Success!! A few years ago I took a class with John Flynn. And even though the class was on hand quilting, he gave us a handout for how to extend a single piece of fabric when you don't have enough to piece two vertical or horizontal segments together for a back. I seem to remember seeing him demonstrate this on TV, too -- maybe on Simply Quilts. I kept the handout, intending to try it someday. And the day finally arrived. My quilt, "Sand and Surf" (a/k/a Bob and Weave) is 40" x 53". For the back I would need at least 48" x 59". The fabric I wanted to use for the back was 41" x 80" (after cutting off the selvage for a friend who collects them) . What's a girl to do? Even though it was on my design wall in late October, I was having trouble understanding the formula and the drawing. I decided this week's guild retreat would be a perfect place to spread this out and enlist the aid of some math-wizard friends. Success!! You can tell by our messy worksheet that we were struggling to put the right numbers in the right places. Once we determined that we needed a piece of fabric a little under 2 feet long, we rounded that number up to 72 inches and cut the length. The next step is to cut the back on the diagonal from corner to corner. Donna says, "The easiest way to mark for cutting would be to snap a chalk line." Doh. We're at a retreat, Donna. So we substituted a long tape measure for the chalk line and drew a line along that. BTW, isn't this a great retreat space? It was late at night so the room is kinda empty. Anyway, I cut along the line. The next step is to slide the left side (from where I'm standing) up along the diagonal until you reach the desired width. We had taped a tape measure along the edge of the table so we'd know when we hit the magic mark. We marked and cut off the points that extended above and below the top and bottom edges and that's all the waste we had. The last step is sewing the seam and pressing. John recommends a 1/2" seam, so that's what I did. And that's my little tutorial for the day. I hope you will try it. You can always contact me if you have questions. Linking up with Sara at Whoop Whoop Fridays. To print your own copy of his technique for a diagonal-pieced back, go to John's website. John states that this is the most efficient way to make the back whenever the needed width of the quilt back is no more that one and a half times the width of the back fabric on hand. It saves fabric and instead of having a straight seam with the bulk of the seam allowance all in the same spot as everything rolls up, the seam allowance rolls up diagonally along the back. Wednesday was the last full day of retreat. What I envisioned being a quick project took all day. Does that ever happen to you? I was "Playing with Blocks." I discovered that the extra strips I thought were designated for more blocks were not the proper size, thus making it necessary to work with the finished blocks on hand. After determining that the proportion of length to width was off, I removed the bottom block from each row and added them to the right side. It's still a small quilt, but will be OK for a class sample and ultimately a baby quilt. So I merrily began sewing the rows of blocks together, forgetting that I needed to add the top and bottom filler triangles before sewing the rows together. HALT the machine! A village was assembled and we jointly agreed on the best choice of available fabrics for the filler triangles and inner border. The rest of the day was spent unsewing a bit at each end to accommodate the filler triangles. In the process I stretched the you-know-what out of those end blocks. Even though another critical project was waiting, I didn't want to pack the blocks away without stabilizing the bias edges. On went the inner borders. Here's where it stands till I can pull an appropriate border from my stash. I had much needed assistance from Donna M who had spent her whole day wrangling the border on Orca Bay. Due to illness and other emergencies, we had a small group at retreat this time. Nevertheless, a good time was had by all. A day and half into retreat -- and it's been a productive time for me so far. I arrived about noon, ate lunch, and settled in Monday afternoon. The first order of business was trimming and binding Brite Irish Gran. Even though I had brought several fabrics, I opted to use the back trimmings for the binding. It's definitely bright! Next up was the binding for the cruise quilt. Again, most of the fabric I brought was rejected, but I managed to find something that would work. Before heading to bed last night I put the final border on Bargello with a Twist. I had tested the technique with some fabric I had on hand so this quilt ended up rather small. Nevertheless, I think it is a nice size for a crib. First thing this morning I cut the back and packed it away. An empty project box is a beautiful thing! On a roll -- or so I thought -- until I hit a number of snags today. I had decided to substitute the piano key border on True Blue (a Miss Rosie pattern) with a solid border, but the fabric I brought just wasn't right. I did manage to get the inner border on before packing it back in the box. Deciding it was time to work on something relatively new, I brought out Elegant Garden. I had made the strip sets, cut the chunks, and made 4 sample blocks over a year ago. Fortunately I had made a chart of where everything was supposed to go, but I had not recorded what my cryptic coding meant: M-F, M-S, S-F, and S-S. I studied on this mystery as I was making the remainder of the blocks (thank goodness I had pinned the chunks for each block together). Unfortunately I didn't have enough of the sashing fabric so it went back in the box. So, have you cracked the code? M = multi-floral; first S = single-floral; F = flowers; second S = squiggles. Aren't you glad you asked? I'm Playing with Blocks tonight. Stay tuned for further updates.